A new morning was upon us, and the familiar misty cloud that lives over Camp 17 greeted us and the new day. After a delicious breakfast of spacon (spam bacon) and oatmeal, we learned of our upcoming “Plan of the Day”. With safety training winding down and afternoons starting to become free for academics and field science, we were all given the choice of a variety of different opportunities to take part in for the day. We started our day in the library, with a lecture by academic director Matt Beedle that introduced us to photogrammetry. Photogrammetry. The term was familiar, but I really had no firm grasp on what it meant. Matt described photogrammetry as “the science or art of making reliable measurements using photography”. During lecture, we explored the two types of photogrammetry: terrestrial (on land) and aerial (from the air). The focus of this lecture was on exploring and using Structure-from-Motion (SfM) Photogrammetry. SfM is a low-cost and effective tool that we utilized to obtain high-resolution datasets. The SfM method relies on multiple overlapping images that photogrammetric software uses to match points taken from the same feature in each image. With that in mind, Matt prompted us to think of some difficulties we may have with using this method on the icefield. One of the primary issues we would face in our attempts to image the icefield would be the lack of these identifiable features on the surface, due to it being a vast white expanse. Nearby Lake Linda, on the other hand, would pose as the perfect target for our experiment. The lake is a meltwater feature that drains subglacially down the Lemon Creek Glacier into the Lemon Creek valley. Due to its identifiable ridgelines and rock surfaces, it includes many reference points for the SfM software to do its analysis. Moreover, it is an ideal location to use aerial photogrammetry to model the elevation of the lake basin because it is not an easy task to obtain these measurements terrestrially. After a discussion on the pros and cons of drone flight path design, our initial task was to create two flight paths. During this discussion we chatted of techniques related to camera angle, area coverage, and possible difficulties with the surrounding topography. We students collaborated to design two paths: one that flew in a spiral pattern radially outward, with the camera facing at a 45-degree angle, and the other in a snake-like pattern with the camera facing straight downward. We had to think carefully about our camera angle choices, because if the angle of the camera were at the same angle as the slope of a feature, the image would not capture it. Student Alex Burkhart explains that by creating the spiral pattern, the 45-degree camera angle would continuously capture the rim of the lake as well as always capturing a portion of the concave basin. I helped to design the snake pattern, with the intention that by having the flight zig-zag over the surface with the angle facing straight downward, we would cover the most area and have the smallest chance at missing any features. After we had our paths set, we journeyed out on our skis towards Lake Linda. Once in the field, our first priority was placing Ground Control Points (GCPs) around the rim of the lake. These GCPs served as exact locations for JIRP faculty surveyor, Uwe Hoffman, to collect GPS coordinates. With these GCPs geo-referenced, we can later locate our whole model in space. We wanted to space the GCPs consistently around the rim of the lake, so we decided to make the hike up and around the large moraine on the back side. The hike consisted of a side-hill ski up to a small ledge where we removed our skis from our feet and continued to bootpack up the ridge. In order to test the different methods of photogrammetry, students Auri Clark and Cézy Semnacher took photos terrestrially along the hike using their iphones. After placing all of our GCPs, we started our drone flights. During Spiral Linda, everything was going as planned until we noticed the drone getting pretty close to the rocks. As it flew closer, we could start to hear the concern in Matt's voice: “Is the drone going to hit the cliff? Is it worth continuing the flight?” After some speculation, Matt made the final decision to abort the mission. For our second flight, “Snake Linda”, we changed the flight elevation of each point to ~40m higher than previously done. We started our flight, everything going as planned, until we noticed an unexpected visitor: above the ridge we could see an eagle flying curiously around Lake Linda. Now we were not only on patrol to make sure the drone didn’t crash into the rocks, but also to keep an eye out for an airborne eagle attack. We suddenly noticed the drone once again flying precariously close to the rocks: How could this be? We had just updated all of the settings to make sure our flight ran smoothly. We re-checked the flight path, and then realized our mistake: we had neglected to adjust one point by 40 m. To prevent disaster, Matt took over manual control of the drone. All in all, after a few close calls with the rocks and one pesky eagle, we had collected our field data. Once back at Camp-17, Matt uploaded our data into a program called Photoscan. Photoscan generates a point cloud, which creates a 3-D surface that produces a model from all of the aerial photos taken in the field. We can use this 3-D model of Lake Linda to visualize and obtain surface elevation measurements. Unfortunately, the images from Spiral Linda weren’t recorded by the drone, so we only created a model using the Snake Linda flight. If we were to do this field experiment again, we would try to recreate the Spiral Linda flight so we could compare it to our current model. We can continue to use this technique in the future to observe the surface elevation changes over time of our favorite meltwater lake, Lake Linda. “How is everyone?” my trail leader asked after a long stretch across the entire Lemon Creek Glacier. Perhaps in the royal sense, my answer to that question would be that I had never been better. I mean, I was immersed in a beautiful landscape, surrounded by incredible people with many having expertise in my immediate academic interests. In that moment, however, I simply replied with a resigned ‘so-so’ gesture and continued to trudge on. My feet were sopping wet with freezing cold snow melt, the emerging blisters on the backs of my heels were each the size of a quarter and the windy rain had reduced visibility to a whopping 8 meters in all directions. All I could think in the midst of my disquietude was that I “only had two more hours of this awful slog to go” before I could return to the shelter of camp 17. To put it aptly, I was miserable for I had brought myself lower than did any of my perceived woes. Rainy day out on the Lemon Creek Glacier. Photo by author. I have since received time to reflect and the sun’s rays to rejuvenate (seriously, I’ve never been so happy to see the sun). As such, I have concluded there is something powerful in experiencing your own ugliness. By putting on display the worst possible reality you are capable of propagating, you enable yourself to improve and grow as an individual. Trust me, as someone who nearly ritualistically makes love to the snow by how much he falls on skis, I know now that patience and a positive attitude are crucial to survival on the Juneau Icefield. Sunny blue sky on the Fourth of July. Photo by author. I am able to see the beauty inherent to the otherwise ordinary or mundane. Take the Fourth of July, for example. With the humility gained from the day before, falling during ski practice was a pleasure and loads of fun. The sky was a whole new vibrant shade of blue and the sun shone with a brilliance I hadn’t ever taken the time to appreciate. In the evening the most majestic sunset emerged, dousing the sky in strokes of bright orange and pink. Even though I had expected the Juneau Icefield Research program to expand my academic horizons, I feel as the mountains and glaciers are teaching a lesson of their own. As to what that may be I am only beginning to understand. So the next time I am asked “How is everyone?” without regard to my immediate deterrents, I will reply with “great!” and wholeheartedly mean it. Sunset on the Fourth of July. Photo by author. Since the main focus of JIRP fieldwork is mass balance (digging snow pits to determine the annual health of the glacier), the hydrology group decided to examine the relationship between mass balance and stream flow on the Lemon Creek and Taku glaciers. Both glaciers have historic mass balance data and also feed into United States Geological Survey (USGS) gaged streams, giving us two datasets to use in our analysis. Additionally, we will also be using meteorological data (temperature and precipitation) in our models. Laurissa cores a sample of snow in the mass balance pit. The goal of our project is to examine the fluxes in glacial accumulation and ablation and to determine the impact of changing glacier dynamics on downstream ecosystems (both terrestrial and marine) which are dependent on glacial melt water. For example, salmon habitats require specific streamflow and sediment conditions to spawn, and changes due to accelerated melt may impact their habitat and breeding environments. We are excited to see different relationships between all of the variables, and we are waiting to get back to our respective universities to continue to analyze data. Kim looks at a supraglacial stream. French Alex, Kim, Laurissa, and Natalie measuring a stream. In addition to looking at the overarching hydrology of icefield, we also took several field trips while we were at Camp 26 to look at the water features in the ablation zone. We mapped hydrologic features, looked at the evolution of supraglacial streams, and explored ice caves under the Llewellyn glacier. The hydrology group! Laurissa, Kim, Lindsey, and Carrie. Our team got an early start on the traverse from Camp 17 to Camp 10. The sky was cloudless and blue, and there was a sense of adventure throughout the group. A not-so-graceful ski down the Lemon Creek glacier ended at the blue ice, where we prepared ourselves for the trek with crampons and some excitement about the alien landscape. On the traverse: Lemon Creek Glacier. There is no other blue like that of a glacier, freshly exposed from the melting snow pack, alive and creeping slowly along. Aware of the quiet river beneath us, we trekked on and on, up and up, to Nugget Ridge. 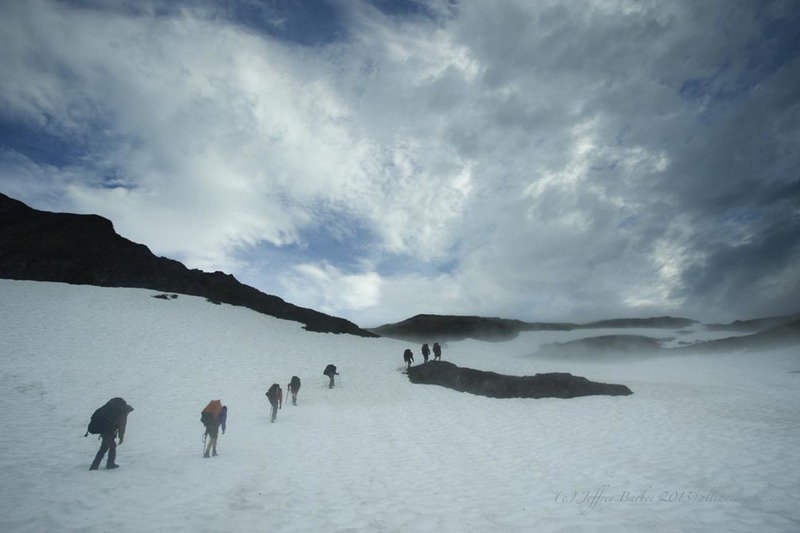 The clouds crept in around us just before the crevasse zone, where we roped up in teams, double and triple checking each other on the skills we learned at Camp 17. Getting roped up in the clouds at the top of Nugget Ridge. Slowly through the foggy mountain pass we forged ahead, watching our tracks and the slack in our rope with a heightened sense of things, ready to react to any movement, any change in landscape. The fog let up just as we finished the heavily crevassed trail, and we all stood in silence with our first view of the deep icefield. Peaks jutting from the ice as far as any heart could imagine, and farther than our eyes could see. The sun turned the mountains purple and blue, with soft orange and pink snow and ice hugging every slope. A view of our campsite, the Norris Cache, was a tiny spot in the distance, above the Norris Icefall, with Death Valley sinking between us. I knew right then, that everything I had ever done had led me to this one moment, to this one place. I found my limit and left it 6 miles behind me, 1000 feet below, pushing past my breaking point to find out who I am, and where I belong. Down we went, following with tired eyes and weakened legs into Death Valley, which seemed to go on forever. As the sun sank behind the peaks, the sky gave up its starry secrets, and we pushed on under the shining constellations, the Big Dipper leading the way. We finally reached the base of the Norris Icefall, weary from the relentless push. Everyone was helping each other, from layering up, to eating and drinking, staying warm, staying positive, getting prepared for the final push. We roped up for the crevasses on the icefall, checking each other’s exhausted knots 5 or 6 times, just to be sure. We began the climb up the icefall, slow and steady, calling out to each other as we went along to help keep the focus. The crevasses were deep blue canyons, as dark in the bottom as the night sky above, only there were no stars down there. It was like climbing the back of a sleeping blue dragon, slowly we inched our way to the top. At last, the tents were in sight, and the sweet thoughts of a warm sleeping bag sank into our minds. We all arrived safely, together, and sleep came easily that night. The next morning was bright and quiet, with a long straight shot to Camp 10 across the Southwest Branch and the Taku Glacier. The aches and blisters were no match for the need to finish the trek. We geared up and headed out early, taking it hour by hour, minute by minute, step by step, and enjoying the wild view the entire way. After what felt like days we got a glimpse of Camp 10, perched high on the rocks ahead of us. The last push took us to places we never could have imagined, and there was no greater gift than taking off the skis and hiking up the rocks to Camp 10. Tears of pride and joy brought me to my knees, and as I looked back at the ice below I felt strong and happy. Happy to be part of something so vast and meaningful, proud to be here with this team, in the most wild classroom on Earth, the Juneau Icefield. Last night the students and staff members of JIRP 2013 were all reunited after several days of travel. This year 31 people completed the traverse from our first camp, Camp 17, to Camp 10 on the edge of the massive Taku Glacier – a total distance of 36 kilometers. Members of Trail Party Two wave goodbye to Trail Party One. Photo by Adam Taylor. The first 10-person trail party (with co-author William) left at 9:00am, under beautiful sunny skies, and descended the Lemon Creek Glacier in 45 minutes. A day later, the second 21 person trail party (with co-author Kamil), left at 5:45am, in thick fog. The fog created a treadmill sensation, as white-out conditions in all directions created the illusion of skiing in place. Under these conditions it took us 3 hours to descend the Lemon. Some skis were very slick, and allowed one to easily shoot down the glacier. Other ski types and comfort levels forced people to shuffle down the glacier, so we could only start moving until the person behind us was visible. As we approached the margin of the Lemon Creek Glacier, rocks, patches of red algae-stained snow, and areas of grooved blue ice emerged from the fog. Looking back up towards Camp-17 from the lower Lemon Creek Glacier, as seen by Trail Party One. Trail Party Two reached this point in fog. Photo by Adam Taylor. From the base of the Lemon Creek Glacier the trail parties ascended several steep slopes, gaining approximately 1,000 vertical feet in elevation, in order to arrive at an area known as “Lunch Rocks”. The outcrop served as a nice resting spot and offered an outstanding view of Devil’s Paw, the tallest peak on the Juneau Icefield and a popular destination for alpine climbers. This peak lies on the Canadian border, and stands as a staunch reminder of the long distance that we have yet to travel. From this point, we traversed the upper Thomas Glacier to the base of Nugget Ridge. We climbed up the steep and rocky ridge with skis on our packs, until we could gain a safe access point to the upper Norris Glacier. Nugget Ridge was a pleasant ski-break for some of us. Photo by Sarah Bouckoms. As the second trail party tied into their rope teams, the wind started to blow and moved the fog in and out, providing short glimpses of the mountains around us. It began to rain lightly, but horizontally. Some of us tied parachute cords around our skies as brakes, while others used climbing skins. We carefully wound our way down through crevasses, crossing snow bridges over large crevasses. Looking outward, the snow dipped away at a sharp angle all around us, revealing mountains below. Nearing the end of this descent, the wind ripped Jai Beeman’s rain fly from his bag. Because we were roped up, we had to watch it fly into the distance. At the end of this slow descent the weather finally cleared up. Our group descended to Death Valley with ease, listening to music on Adam Toolanen’s speakers while enjoying the blue skies. The teachings of Camp 17 come into play as we skied roped up down from Nugget Ridge toward Death Valley. Photo by Sarah Bouckoms. Sarah Cooley skis by a crevasse during the descent from Nugget Ridge. Photo by Adam Taylor. The name “Death Valley” implies a far more ominous scene than the seemingly flat and expansive glacier which laid before us; however, we rapidly came to the conclusion that the sun cups were enough to kill at least one’s forward momentum. After a several-hour traverse across the valley, we encountered the final obstacle before the cache camp, the Norris Icefall. The ascent up the icefall involved hours of negotiating a maze of crevasses while divided into rope teams. Once on top of the icefall we followed the fresh snowmobile tracks left by Scott McGee. He had established the nearby Norris Cache, where we would spend the night in tents set up on the snow. Skiers approach the Norris Icefall, which looms above Death Valley. Photo by Adam Taylor. Skiers make their way up to the Norris Icefall. Photo by Sarah Bouckoms. Sarah Bouckoms smiles at the sight of the Norris Cache after a long day. Photo by Jamie Bradshaw. After dinner we hit the sack. The snow’s cold presence was felt even through a tarp, sleeping pad, and sleeping bag. The next morning we slept in and woke up, feeling a little sore and packed up our gear at a leisurely pace. From the cache we made a final steep (if short) climb. Most of the rest of the day was spent gradually skiing down the gradual slope of the Taku’s Southwest Branch towards the main trunk of the Taku Glacier. On this final 18 kilometer stretch of our traverse to Camp 10, we became familiar with the phenomenon known by some in our group as the “Alaska Factor”, which describes the extreme scale of things here on the Icefield. From the beginning of the second day, we could practically see Camp 10, and spent the major part of the day skiing towards it. When we reached Juncture Peak (at the juncture of the Southwest Branch and main trunk of Taku Glacier), we knew that we were approaching our goal, and that we only had to cross the main Taku Glacier to reach Camp-10. Given its size, this took an additional two hours. Both groups traversed the glacier in the sun, a welcome change from the conditions at C-17. Both parties also experienced the katabatic winds that commonly flow down the Taku, resulting from the densification of air cooled by contact with the snow. A couple large clouds hovered around the camp, about a hundred meters from the glacier surface. Upon emerging from this strange scenery, we were met with familiar faces and a warm dinner. A humorous sign informs the trail party of the next day’s travel distance. Photo by Sarah Bouckoms. While writing this, I am sitting in The Cook Shack at Camp 17 listening to Pink Floyd while the cooks are planning lunch and our fearless leaders are setting the route for the Norris Cache, our first move to Camp 10. Once the route is set and the weather softens, the first trail party will hit the trail. Fortunately, I am in the first trail party and this time I will have first dibs on sleeping arrangements! I am really looking forward to seeing new sights and I am pumped to endure what I have been told is the most physically and mentally challenging part of the icefield traverse. Another reason why I am so excited to arrive at Camp 10 is because I know just how good the view is. Unlike the other students, Camp 10 is not a complete mystery to me. If you followed the 2012 JIRP blog, you may remember my post from last summer about my fortunate flight to Camp 10. I first heard about the program nearly three years ago when enrolled in a Glacier Surveying Field Methods course offered by Mike Hekkers at the University of Alaska Southeast in Juneau, Alaska. I was immediately intrigued. In 2011, I was lucky to be able to spend time with the JIRPers while they were in Juneau for a week. I hiked to Herbert Glacier with them and showed them our surveying sites on Mendenhall Glacier. Last year, I saw the Logistics Agent position for JIRP was available. I decided to apply for the position because it would be a great way to support JIRP, get involved and I figured it would give me a unique perspective of JIRP in hopes of participating as a student in the summer of 2013. You could say that I had the “JIRP bug”. Nearly all of the JIRP mystery is removed for me because of my logistics position last summer. I understood how the food, supplies and mail get here, I knew what many of the camps look like and approximately how long we spend at each camp, I knew how meals work and how day and multi-day trips work and I knew of the joys of Atlin, BC. I also knew three of the students participating prior to JIRP, I knew the staff members and many of the guest lecturers from previous JIRP experiences. Most of the time I really appreciate my JIRP background because I can answer many questions that students have and I can prepare myself for upcoming events. Other times, this background takes some of the excitement of the unknown away from me that the other students have. Needless to say, I am very thankful to have this JIRP knowledge and to have the unknowns of the routes from camp to camp! While coordinating logistics in Juneau last summer, I read the blogs, flew to Camps 10 and 18, and saw how close the students and staff grew. I was honored to be a part of the JIRP family, but I wanted to learn and grow with everyone on the ice. I knew that JIRP would be an amazing experience and I anxiously awaited the summer 2013 season to begin. On the hike up to Camp 17A, I kept saying to myself “ I can’t believe this is finally happening!” So far, JIRP has been everything I have imagined it to be!